Never miss a helpful tip! Peak Ergonomics is key piece to our Safety Culture. Paul and his team provide key insight to ergonomics and help our employees address possible issues early on with professional intervention. They help us with our stretching program and improving the health of our workers. All of the folks at Peak Ergonomics are pros! I have worked with Paul, Kelly, Tyler and the rest of the crew many times over the last fifteen years, and am always impressed with their professional work, expertise and knowledge. They're a great group of folks and I really enjoy working with them! Keep up the great work! Paul and the team are always looking for ways to improve employee employer relationships by helping reduce exposures. They are taking an approach unlike most rehab services and beating the problems before they are too big to avoid surgery. Great customer relations and service on top of that! Paul and his team do a great job! If your ready to create a positive ergonomic safety culture give Paul a call. 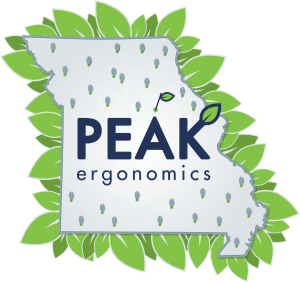 The folks at Peak Ergonomics are knowledgeable and always very helpful. If they don't know the answer to a question or need, they will find it. Special thanks to Missouri Employers Mutual (MeM) for the use of their facility during filming.